NEOMED is located on more than 120 acres of beautifully landscaped grounds and open space in Rootstown, Ohio. Centrally located between its partner universities and affiliated clinical sites, the University it just a short drive to restaurants, shopping, entertainment and major highways. Take the next step in becoming a pharmacist…schedule a visit today! When you click the link to schedule your visit, you will be directed to a very short form that asks for your name, an email and mailing address, an area of interest, and an estimated entry term to NEOMED. Once completed, you will have a personal portal to all of our visit dates and opportunities, and we’ll include you when we share all of our updates and offerings. While you are here you can get feel for campus, see our outstanding facilities, meet currents student and faculty, and gain insight to how you can benefit from interprofessional training. NEOMED is located in Rootstown, Ohio, located in Portage County. 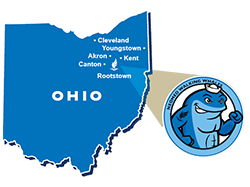 The region is commonly referred to as Northeast Ohio. Take the Ohio Turnpike to Exit/Milepost 193. Follow St. Rt. 44 South past Ravenna and into Rootstown. NEOMED is on the right. Take I-77 north to I-76 east. Follow I-76 through Akron to exit 38A. Turn right o the exit onto St. Rt. 44 south. NEOMED is on the right. Take I-71 north to I-76 east. Follow I-76 through Akron to exit 38A. Turn right o the exit onto St. Rt. 44 south. NEOMED is on the right. Take I-480 east and continue on St. Rt. 14 through Streetsboro. Take St. Rt. 44 south past Ravenna and into Rootstown. NEOMED is on the right. Take I-76 west to exit 38. Turn left of the exit onto St. Rt. 44 south. NEOMED is on the right.